Unlike the coastal based walks that the peninsula is renowned for, the Clarks Cliffs trail gives walkers an alternative and unique inland experience. The walk takes in wet eucalypt forests crowded with plant life and cliff top views of a majority of the peninsula. Track conditions differ throughout the walk making this 4 hour, 8km, walk an interesting challenge at times. View Google Map Directions From Hobart head over the Tasman Bridge and continue on the Arthurs Highway (A9), turning right at the main intersection in Sorell (sign for Tasmanian Peninsula). 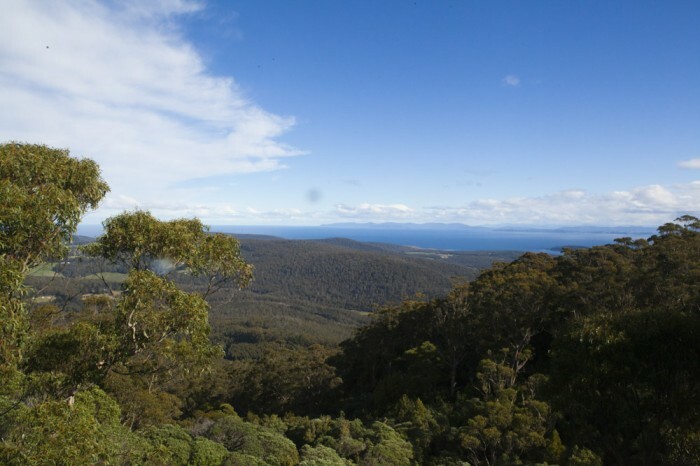 Continue towards Port Arthur, taking the right after the Tasmanian Devil Park, onto Nubeena Road towards Koonya. 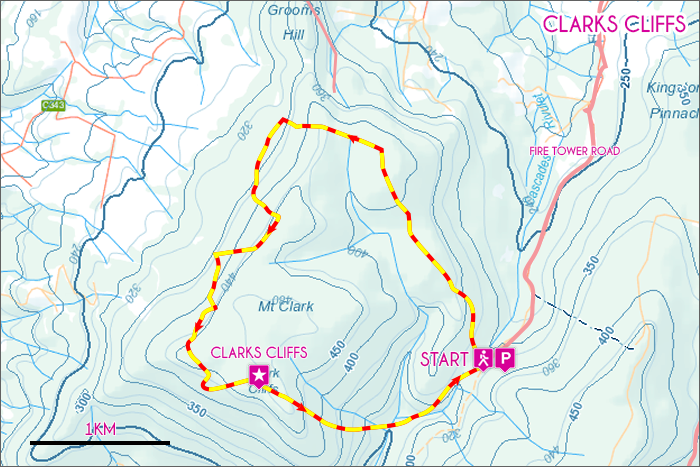 After 4.5km turn left onto Fire Tower Road (clarks cliff is signposted). The walk begins at the end of the road, 4km away. This circuit walk can be completed in either direction. However we recommend that walkers begin the walk on the fire trail section (directly adjacent to the carpark) to minimise climbing steeply through forest section. This initial section of the walk is gently graded and easy going. At times the dense bush on either side trail fully immerses you, as if walking through a tunnel. The feeling is quite fanciful and comforting, though perhaps not to those suffering from claustrophobia. Before long the trail opens up and glimpses of the northern coast of the peninsula can be seen through the trees. A very short side-track at this point provides brilliant views of the hills descending onto Norfolk Bay and Koonya. Shortly after the track leaves the fire trail and heads west into dense forests. This section of track is quite overgrown with beautiful Mrytles and eucalypts. Care should be taken when navigating your way along the trail. Going here is slow, but easily managed. As you walk higher over the gradual climb the forest opens up and soon another sidetrack is found, this time heading to Musk Forest. 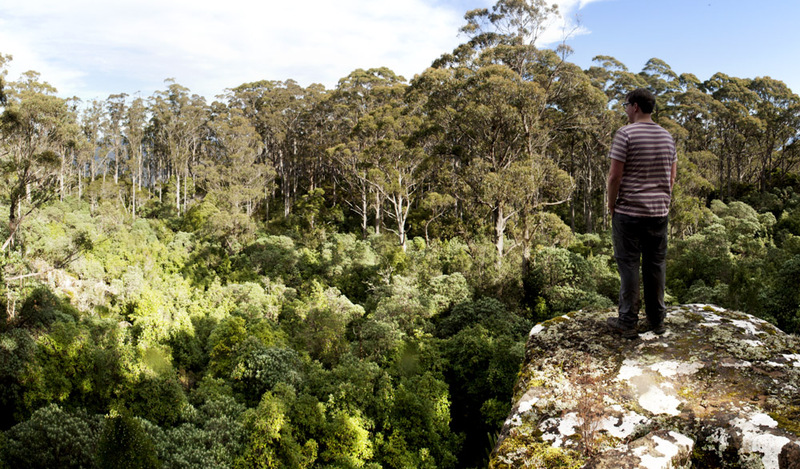 Dwarfed by the cliff top you walk out onto, the Musk Forest, a sea of trees densely populated by Musk and Blackwood is a sublime highlight of the walk. Back on the track, a few minutes later the summit of Mt Clark (480m) and Clarks Cliffs are reached. From these dolerite outcrops the south-western section can be viewed in all its beauty. Heading back towards the carpark now the trail becomes more challenging, plunging down a steep track skirting Plummers Creek. In many sections the trail is wet, muddy and quite slippery. For the next 3km the trail zigzags, occasionally sending you in irregular directions back up creek beds. The walk soon flattens out and dries out… just before popping you out at the end of the track, 50m above the carpark. 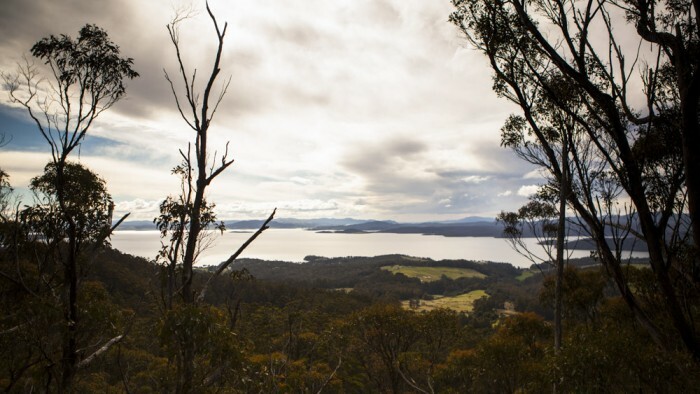 This walk is definitely not what you expect of the Tasman Peninsula but it does have a certain charm. Though muddy and difficult to traverse in sections, the unique views which are most likely rarely shared more than make up for it. The trail can be hard to follow in selections, always be conscience of your surroundings. Additional, as the name suggests, there are cliffs, don’t fall off them.